The West Colvin Community Garden was established May 1st, 2015, following the award of a “Green Lots” grant from the Syracuse Land Bank. 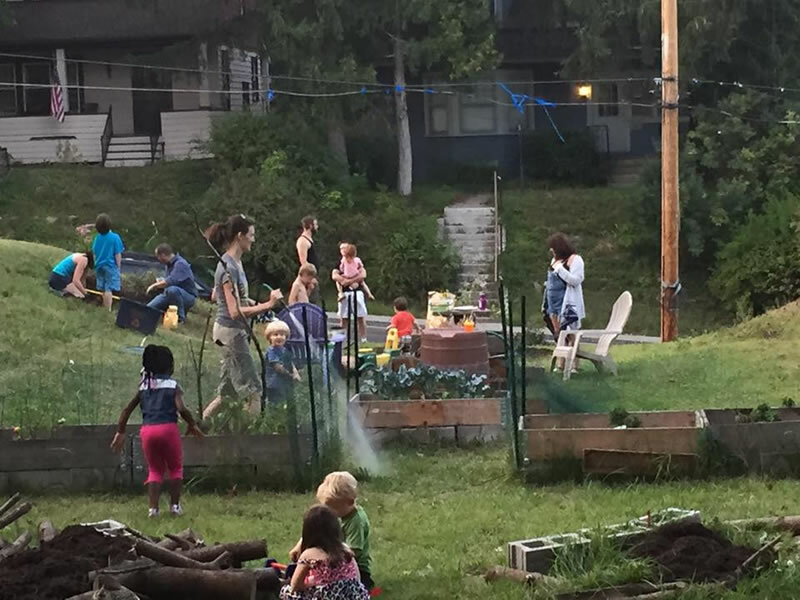 Since then, several near neighbors and friends in the Strathmore neighborhood visited the site regularly throughout the summer to water, build, rake and plant. We grow tomatoes, cucumbers, peppers, broccoli, swiss chard, watermelon, strawberries, raspberries, zinnias, mint, parsley and chamomile. We have five permanent raised-box beds filled with OCCRA compost and topsoil and several in-ground planting beds established with perennial flowers & bulbs. The pollinator “butterfly” cut flower gardens features colorful perennial plantings: sunflowers, coneflower, bee balm, sedum, buddleia, daylily, lavender, lamb’s ear, native milk weed and Joe-Pye weed. In our woodland garden area, under mature maple and pine trees, we grow hosta, fern, anemone, columbine and woodruff, bordering a grass and clover lawn. We did not have a regular volunteer day this season, but now that the raised beds and healthy soil is in place, we hope to host weekly gatherings starting April 2016. We do not charge any fees; this garden is designed to be enjoyed by everyone, freely. Please contact the garden coordinators at brandycolebrook@gmail.com or lydiamumford@ymail.com to find out how to get involved at this garden.